The Outer Worlds is Obsidian RPG’s latest dive into the genre, and one of our most anticipated video games of 2019. 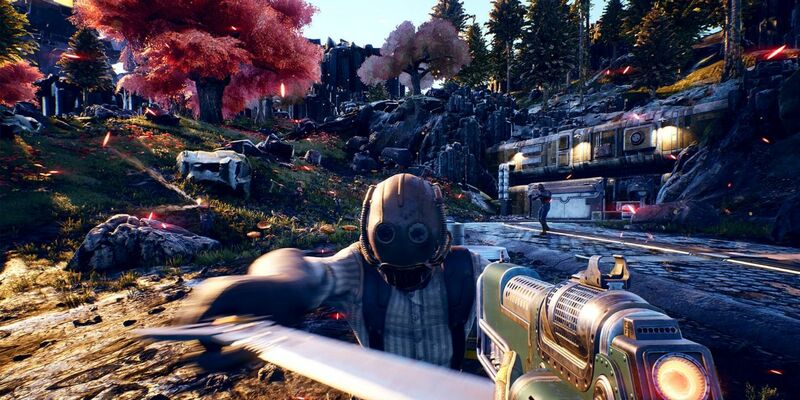 There hasn’t been much footage of the game aside from the reveal trailer, so Obsidian fans were understandably very excited when there was a The Outer Worlds gameplay demo showed off at PAX East recently. The Outer Worlds looks to be drawing on the influence of the other titles that Obsidian has worked on, like the immensely popular Fallout: New Vegas. After the success of the Pillars of Eternity franchise and the recent acquisition of the company by Microsoft, fans are hopeful that this means that Obsidian will have the ability to take its work to the next level thanks to the added resources working under Microsoft will grant it. TechRadar has reported on the latest The Outer Worlds gameplay demo to emerge from the recent PAX East, and noted a few key things about the demo which hint at the direction that Obsidian is going to take with the game. The footage looks like it shows off an incredibly vibrant dystopia, replete with neon billboards, banners for prolific propaganda films, and a whole bunch of interactive dialogue that toes the line between humorous and dark. The latter portion of the gameplay demo also shows that you can essentially take an energy scythe or weapon to anyone that you want, including a cowering civilian that might just be minding their own business. It’s not quite certain how that particular mechanic is going to work in the final game. The Outer Worlds gameplay demo shows that indiscriminate killing appears to be a viable way to play the game, but we’re not really shown evidence of how that affects the player character’s relationship with the world and the NPCs that have to interact with them. It seems likely that there are reputation and morality systems at play here, but without knowing that much more about the state of play in The Outer Worlds, it’s hard to extrapolate how having the option to slaughter anyone without a noticeable narrative consequence is Obsidian’s usual modus operandi at all. The Outer Worlds is still quite some time away, and the gameplay demo definitely left some questions in fans’ minds even as it presented dynamic and intriguing environments to explore. The concept behind the location explored in the demo is interesting enough on its own to warrant a second look, and we’ll definitely be waiting eagerly for details on what else is to come.